For many people, Chongqing is a symbol of the recent development of China as a whole. First, almost nobody knows about this place, suddenly it is said to be bigger than the capitals of Europe and now it’s supposed to be the biggest city in the world. But is it all true? 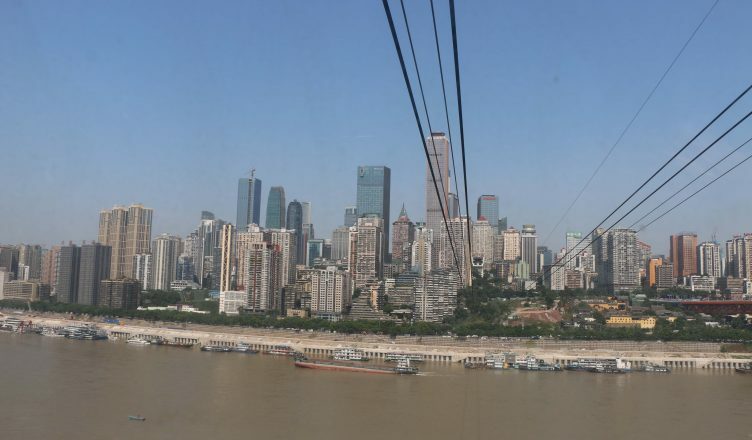 In this article, I want to explain why Chongqing is not in fact a symbol of the development of China for me, as well as introduce the city as a whole to you. As most other big cities in China, Chongqing experienced an economical boom – not only once, but in fact twice. Chongqing might be a well known city along the 3 gorges dam today, but it was also one of Chinas capitals in the past. As most people know, around the time of the second world war, Nanjing was the capital of China, but was eventually conquered by the Japanese. Obviously China needed a new Capital now, at least for the time being. It should be easy to defend but also have the capacities to maintain a capital. The best choice was Chongqing, the former capital of Sichuan Province, at that time also known as Chungking. Because of the trade along the Jiangtze River, the trade was already fairly big, but since it was build into the mountains, it was easy to hide headquarters, factories and other facilities to organize an effective resistance. So this is, how Chongqing experienced a big growth for the first time. After the second world war the capital was moved back to Nanjing and many people in the west forgot about Chongqing. Many years later, the plans about the three gorges dam were revealed, a big project that should controll the floods of the Jiantze and therefore safe hundreds of people from drowning every year. This had two effects for Chongqing: Firstly, many of the villagers from the valleys of the 3 gorges had to resettle in the city. At the same time, there were big constructions: Obviously there was the dam itself, then there was the infrastructure connected to it as well as the new housing for the people that had to resettle. All this made Chongqing grow substantially, however it is not 100% to call it the biggest city in the world. Chongqing and the surrounding area was made a municipality in the 90s, which is in fact about as big as Austria. Although all this area is controlled by the local government of Chongqing, it would be wrong to call all this one city. The city of Chongqing itself, including its suburbs, has about 8 million people, which is just about as much as any other provincial capital in China. You may ball it whatever you like, but it is in fact true, that the city plays an important role and the title of being a “Tier 4 City” is definitely justified. When visiting Chongqing, you should remember those historical facts, because this is also the reason, why Chongqing is the way it is: There are many mountains, many people and in a way, it’s also chaotic. For everybody who comes to China the first time: This is where you will probably get the worst culture shock. When and for how long should you go to Chongqing? We visited Chongqing in the end of August – a very hot and humid time. But then again, it was relatively smog free. Based on the natural environment you have to make a trade off here: Either you accept the hot weather, or you would have to accept the risk of having a lot of smog. All attractions can be visited in one day, if planned efficiently. Chongqing certainly has its own specialities, but culturally, especially culinary speaking, you have to recognize the many similarities between the city and neighbouring Sichuan. People love spicy food and their most favourite spice is the sichuan pepper: a very spicy kind of pepper, which leaves you with a numb feeling in your mouth, as well as a little hint of citrus fruits. The most well known dish from Chongqing is the Hotpot, which you can actually find in many, many places around the city. Hotpot is a Chinese version of a fondue, so there is a big pot in the middle of the table, filled with soup. You have to consider, that the pots can have different forms, which means that actually, you can prepare not only two soups but in fact two or sometimes even up to 9. The conventional pot with 2 different soups is however, what we would recommend. This way, you can try out the typical Chongqing Soup and combine it with a milder Soup. You might just find the original Chongqing soup too spicy, however you will probably not want to get up just yet, if you are hungry. As mentioned above, you can see all the attractions listed here within a day, including arrival and departure, if you are coming from nearby. To help with the planning, please pay attention to the timing, especially when it comes to the boat tour. The cable car was our number one in Chongqing. It was once built to improve the transfer from one side of the rivers to the others, so that locals could get into the centre, without having to decent the mountain first, boarding the ferry and climbing up the mountain on the other. Since the metro and monorail system is built, the cable cars have become redundant, the capacities are simply too small, the distance covered is only relevant for the people that only want to go from one station to the other and overall, the metros are just faster. This is probably also the reason, why there is only one of the formerly 3 cable cars left, which is also more of a tourist attraction than part of a mass transit system – just look at the price. 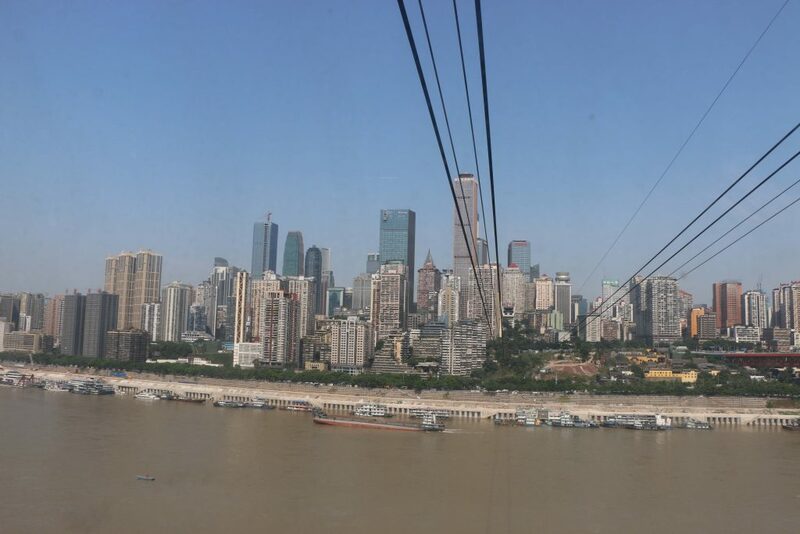 Nevertheless, as a tourist, we found the cable car to be a really enjoyable attraction, it’s simply amazing to glide between the skyscrapers, across the river and eventually admire the skyline from the other side of the river. From the development described above, we can already tell that in the past, there were living areas around the cable car station, however I would not say that this is the case for much longer. During our visit, there were already many constructions underway and from the posters we could tell, that these are going to be bars, restaurants etc. Another indicator for this are the longer opening times, which extend into the later evening – no doubt to enable partying people to reach the bars conveniently. You can find the entrance to the cable car near the exit 5B of the metro station Xiaoshizi, a roundway ticket costs 30 Yuan and including queuing, we spent around one hour at this attraction. The daily boat tours are another great way to get an overview over the city. You simply have to head down to Chaotianmen, where the two rivers Jiangtze and Jialing meet. There you can find several piers, where you can find several tour operators. You might need to ask your way around, since this is also the place, where the cruise ships will stop and those two kinds of boats do not exactly differ in size. Of course these boats have a schedule, usually offering one tour in the afternoon and one in the evening. The one in the evening is a little bit cheaper, but obviously only the tour in the evening offers the big views on the illuminated skyline. In total, this tour should take you about 1 1/2 hours, the tour in the afternoon cost us 60 Yuan per person. Our tour started at half past 2, first we headed up the Jiantze River, roughly up until we were below the cable car. Afterwards we headed back and went up the Jialing River, up until Hongyadong. Then, we headed back to the pier and the tour was over. When choosing the seat, we recommend to take the side facing the river first, furthermore you should pay attention for microphones, stages and speakers. On our tour, there was a big show, which was surprisingly irrelevant to the tour. With all that Noise I would’ve wished for noise cancelling headphones. The boat tour itself however was quite enjoyable, since you could get a different view on the city. This does not make it an absolute Must have, however it was just an overall enjoyable experience. Hongyadong is a small old town in the city centre of Chongqing and shows, how people probably lived here hundreds of years ago. In most places around the world, you couldn’t built too high at that time, however this becomes a little bit easier, if you can just build your home into the cliff. As you can see, we have an old city here, which is an impressive 10 stories tall. Of course you can enter the area in the bottom stories, however you can also do so from the top: There’s a street leading to Hongyadong from Xiaoshizi, which will go alongside the 10th floor of the area. In the top stories, you can find a variety of restaurants, bars and just an amazing view over the Jialing river. In the bottom stories, you might enjoy the architecture of this cramped, but amazing structure, however I do have to admit, that there is nothing worth mentioning to buy there. We spent an entire 5 days in Chongqing and have to say, that this was WAY too much. It is hard to describe, but the city fascinated me in its own way: Similar to Hong Kong, there are many people on a small area, however not only on one layer – Hongyadong is an amazing example of how the people made best use of their space by just building towards the sky. Taking a look at this city is definitely worth experience, however I can personally not imagine to stay in Chongqing longer than previously described.